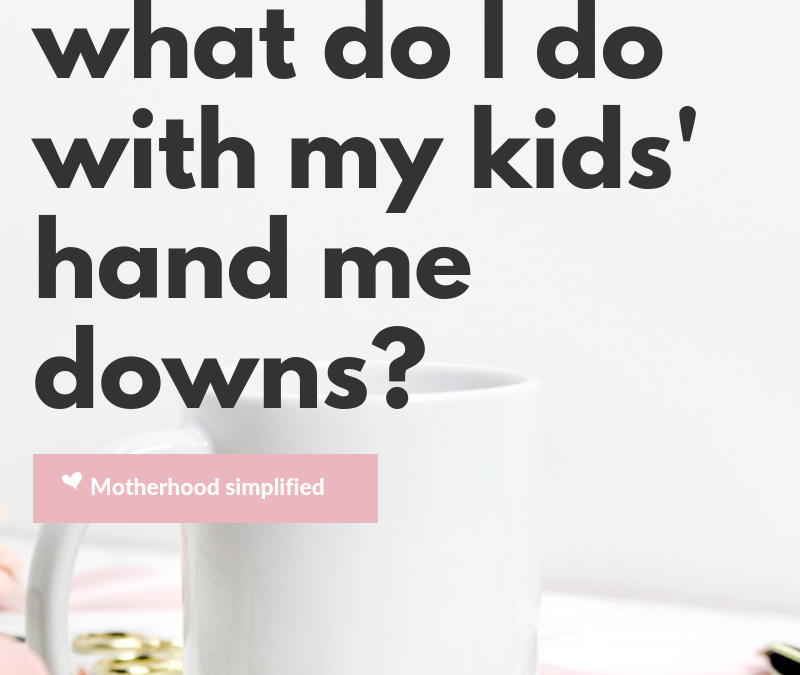 Mom question from the Motherhood Simplified Facebook Community! I have kids of different ages in opposite seasons – what do I keep? As moms we want to be resourceful, thrifty, and NOT wasteful. So we keep all the clothes. We box them up, tuck them away for the next kid and high five ourselves. Then we realize that our kids are in different sizes during different seasons. Or we open up the box and realize we missed the chance and they have outgrown them. Or we take them out and realize that they really aren’t in nice condition like we thought. So we go out and buy more. And add it to the stock pile we already have – cause we thrifty, yo!! So what do we do with our kids’ clothes once they are outgrown and we want to pass them on down? This is my personal opinion so take it or leave it. Or take pieces of it. If you have one child, and you have no set plans of when you will have the next baby – don’t pack up the clothes and keep them for “some day”. That’s crazy and turns your home into a storage unit, not a home. If your kids are more than two years apart, and same gender and same season – don’t keep them. That is a LONG time to store clothes in a box!! And the thing about clothes is they are ever abundant, especially in the smaller sizes. When you find out you are pregnant the FIRST thing people offer to give or buy you are clothes. Allow yourself to have fun getting the NEW person of your family their own clothes. Baby clothes are fun. Personalities are different. Different colors look better on certain people. You don’t have to go crazy and spend hundreds of dollars on each size. You can do this on a strict budget and have everything you need. I know, because I have done it. With all of my kids. We trick ourselves into thinking we are saving money but see the scenarios above and we all know that’s not really how it works. Realize that you really don’t need 30 pairs of pants for a two year old. Less clothing does not equal more laundry. It literally means less laundry. We have never run out of clean clothes since having the base 7-10 outfits per kid. I actually ran out of things to wear for them OFTEN when we were drowning in laundry piles and clothes because I was just too overwhelmed to even attempt to do laundry. True story. This is going to look different for every family, so I can’t give specific instructions for you all but if you take anything away from this post let it be this – we THINK we are doing ourselves a favor by saving every piece of clothing ever, packing it up and storing it for the next kid. The reality is, it often doesn’t work that way because of genders, season differences and just really big age gaps. Give yourself permission to STOP holding onto all the clothes. If you want to keep staple items in great condition for the next kid, GREAT, do that! That makes sense if they are 1-2 years apart. But clothes don’t hold value and you can find them SO affordably that it’s really not helping your budget that much in the long run. Also this – stop buying $50 baby outfits and then being upset people want to buy them off of you for $5. Of course it’s hard to let go of baby and toddler clothes you spent wayyyy too much on! A splurge here and there is great, or if you can truly afford to go all out like that all the time. But being more practical in your clothing purchases for your kids allows it to BE affordable and lets you ENJOY buying, and then letting go of their clothes to a friend or consignment store, or Goodwill. Get into one of my courses HERE! Absolutely agree with saving for the next family!! Thanks the reply!